bbc.comTiger Woods is in contention to win a first major since 2008 despite almost being injured in a bizarre incident on a rain-hit second day at the Masters.The four-time champion hit a four-under 68 to finish six under, one shot behind five halfway leaders including Open champion Francesco Molinari, 2013 Masters champion Adam Scott and three-time major winner Brooks Koepka.However, Woods was almost taken out by a security guard who slipped on the damp grass and clipped his right ankle, causing the 43-year-old to hop forward to avoid a fall. Ian Poulter is the leading Englishman on five under, while Northern Ireland's Rory McIlroy shot a 71 that leaves him level par but world number one Justin Rose bogeyed the last to miss the cut on four over.It is an exceptionally tight leaderboard though, with 22 players within four shots of the lead.But only the top 50 and ties, and those within 10 shots off the lead get to play the weekend. Italian Molinari, 36, had five birdies in a bogey-free 67 early on and was joined by American Brooks Koepka, South African Louis Oosthuizen and Australians Jason Day and Scott.Molinari is enjoying something of a purple patch in his career, with four wins in the past year, including becoming the first Italian to win a major with his victory at Carnoustie in July.But history is against Molinari: Only four players have won the Masters while Open champion - Arnold Palmer (1962), Seve Ballesteros (1980), Tom Watson (1981) and Tiger Woods (2001) - while his best performance at Augusta is a tie for 19th in 2012.Molinari, whose first experience of Augusta National was as a caddie for his older brother Edoardo in 2006, said: "That was good motivation to see how good they were and how much I had to improve. "He spoke before the tournament about how he has worked extensively on his putting and work around the greens because they have let him down in the past. "I've pretty much changed everything you could think of on my putting stroke," he said. "I could have started putting left-handed, it would have been a similar process. "It's still uncomfortable when you're standing over some putts or chips because the margin for error is so small but I've done better than in the past." 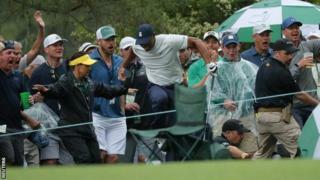 Day, whose best Masters finish is second in 2011, was treated on the course by a physiotherapist for a bad back during Thursday's opening round. The healing hands helped him post a two-under 70 and he followed it on Friday with six birdies and just one bogey, after hitting into a bunker on the 12th.His fellow Australian Scott briefly led on eight under after an eagle on the par-five 15th but the 38-year-old three-putted the short 16th and eventually signed for a 68.Joint overnight leader Koepka had three birdies, two bogeys and a double bogey on an eventful first nine.A wayward tee shot on the second into trees, followed by a second that clattered another tree and resulted in a lost ball and penalty stroke, led to a seven on the par-five second.However, a more solid second nine, with birdies on the 15th and 18th holes, moved the reigning US Open and US PGA Championship champion back into a share of the lead.They were joined late on by Oosthuizen who had just one bogey as he posted three-under 33s on each nine to card a 66. A pushed drive and poor chip cost world number two Dustin Johnson a bogey on the first but eight pars followed before birdies on 10, 13 and 15 moved him up the leaderboard.He was joined by Woods and their fellow American Xander Schauffele, who had eight birdies in a seven-under 65 - the lowest round of the day.And unheralded South African Justin Harding, who had five birdies on the second nine, posted a second successive 69 to also sit one off the lead. World number one Rose, who started with quickly with birdies on his first two holes, added two more birdies on the second nine. However, four bogeys on his card meant he was right on the cut mark at three over playing the 18th and the 38-year-old, who has twice finished runner-up in the past three years, bogeyed the last.It is the first time in his 14 Masters appearances that Rose has missed the cut and he is the first world number one to do so since Martin Kaymer in 2011.After finding a fairway bunker with his opening tee shot and bogeying the first, Poulter birdied the par-five second and then went on a run of nine pars before successive birdies on the 12th and 13th briefly put him in a share of the lead on six under par.However, a "disappointing three-putt" led to a bogey on the 14th and he finished with five pars. "Apart from that I've only had a couple of mistakes this week," he said. "I'm just trying to be smart and not take myself out of the tournament, like I've done in the past. "On his chances this weekend, the Poulter added: "I've got a three percent chance. It was a stat shown on television that 43-year-olds have got a three percent chance of winning this week." Phil Mickelson said playing his 100th competitive round at the Masters just meant he was "getting old" before adding he gets "so excited to be here". "This is a spiritual place if you love golf the way we do," said the 48-year-old, who played his first round in 1991.The three-time champion, who started round two one off the pace on five under par and ended it on four under, said: "I didn't drive the ball well and that's key. If I hit it reasonably straight, I can attack a lot of holes. "If I drive like I did on Thursday, I'm going to have a good week."